The Counterpoint Tactical Income Fund is currently in a “risk on” position, allocating to high yield bond assets. Investors have lately voiced concerns about the Counterpoint Tactical Income Fund’s exposure to interest rate risk. These concerns are especially relevant amid recent increases in bond yields, equity market indices, and the U.S. dollar. The Federal Reserve’s moderate-to-hawkish posture further supports attention to interest rate risk. In light of this we decided to examine high yield bonds’ historical reactions to rising interest rate environments. The results should be somewhat reassuring: Compared with interest-bearing alternatives, high yield tends to outperform in rising rate environments due to its diversification of risk factors. We can consider an investment in high yield as a portfolio of two primary risks: credit risk and interest rate risk. High yield bonds provide a yield premium to compensate investors for the prospect of default. Some amount of credit risk is firm-specific, and investors can diversify away such risk by holding a portfolio of issues from different firms. High yield credit provides additional premium to compensate for interest rate risk – the risk that an asset’s price will decline in response to rising interest rates. Our data are consistent with the notion that credit risk and interest rate risk offset each other. 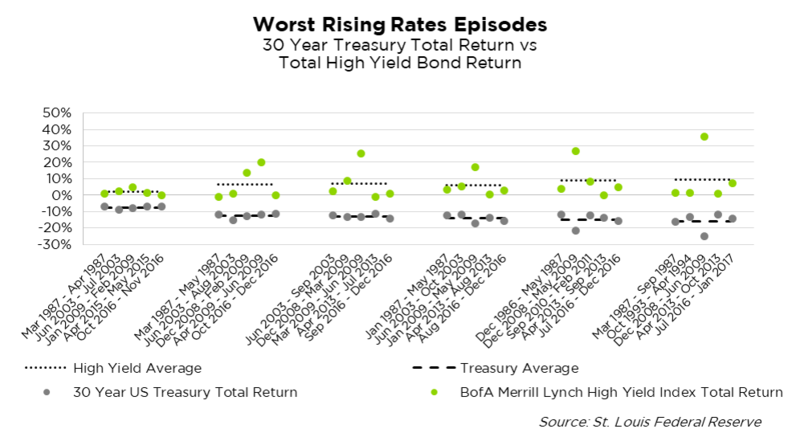 The below charts compare total return performance of high yield bonds vs. 5 year Treasuries and 30 year Treasuries during the worst periods of rising interest rates in the past three decades. We selected 5 year and 30 year Treasuries because in rising rate environments the behavior of these securities is similar to that of other high quality fixed income assets – investment grade corporate, municipal, and mortgage backed securities. As you can see, the average return for high yield corporate credit outperforms both the 5 year and 30 year Treasury total returns in periods of large interest rate increases, and is positive in all cases. The illustrations are shown for general market comparisons and are not meant to represent the Fund. Past performance is no guarantee of future results. 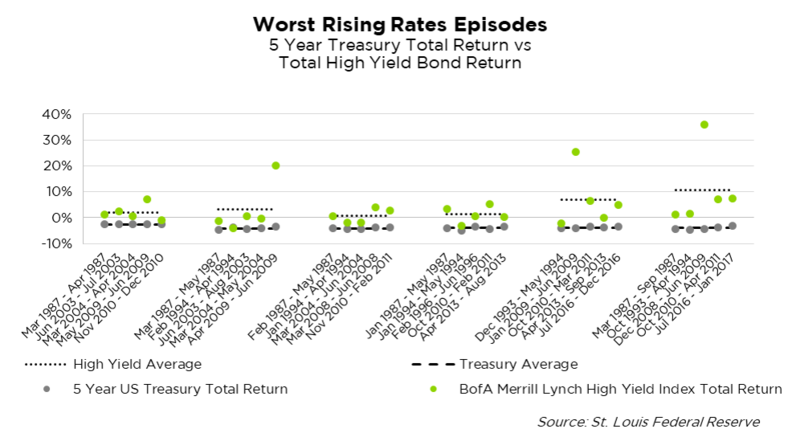 The prior chart compares high yield to 5 year Treasuries over the worst 1, 2, 3, 4, 5, and 6 month return horizons as interest rates increased. We look at short term returns for two reasons: Investors care about short-term drawdowns, and over longer periods high yield bonds’ larger coupons tend to mask price volatility. High yield credit outperformed over each time frame, delivering positive mean returns vs. slightly negative performance for 5 year Treasuries. With longer time horizons especially, the larger cash flows on high yield bonds serve as a buffer against interest rate increases. The long time to maturity for 30 year Treasuries greatly increases downside exposure in rising interest rate environments. Investors in this asset class should prepare for losses of greater than 10% in periods of strongly rising rates. High yield’s outperformance is even more pronounced in light of long-dated Treasuries’ interest rate sensitivity. Since interest rate movements are inverse to returns, in periods of falling interest rates, one would likewise expect much better relative total performance by Treasury and high quality securities. Falling rates often coincide with poor performance of credit sensitive assets. This informs the design of Counterpoint’s tactical strategy, in that it allocates to US Treasuries in times of market stress. When compared with investments in either relatively short maturity 5 year Treasuries or very long maturity 30 year Treasuries, high yield credit tends to outperform in rising rate environments. Why Does High Yield Behave Like This? The most intuitive explanation comes from economic history. When times are good and the economy expands, interest rates tend to increase, while companies have an easier time paying debts and default risk declines. When the economy stumbles, interest rates tend to decrease, while companies become more likely to default amid tougher conditions. Interest rate risks and credit risks are generally negatively correlated, and combining them creates a diversified portfolio. High yield’s combination of credit risk with interest rate risk effectively creates an asset class with lower two-way volatility than other risky investments. This relative stability gives high yield a large Sharpe ratio relative to other high return assets, as seen in the below chart, a stylized version of the Markowitz opportunity set from Modern Portfolio Theory. Among asset classes with higher average returns, high yield offers a substantially attractive trade-off: Returns that approach those of stocks, with reduced volatility. 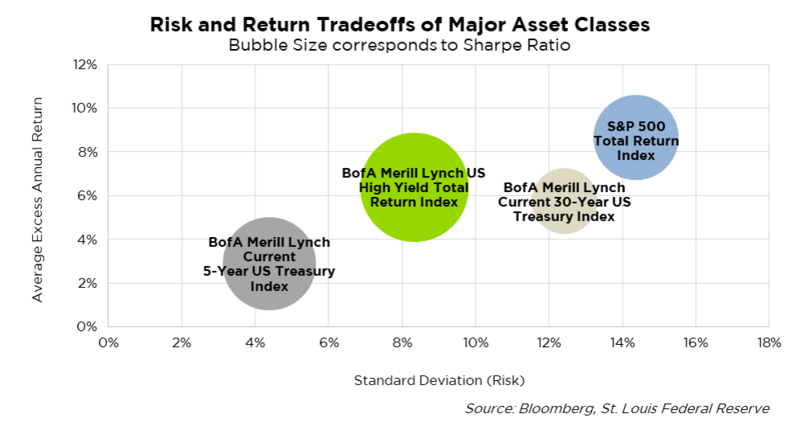 As measured by the Sharpe ratio, the risk-reward is more attractive in high yield than in stocks and in long-dated Treasuries. A high Sharpe ratio is attractive for buy and hold strategies. But it also offers attractive opportunities in trend following. A trend following strategy is more effective in asset classes with lower relative volatility. The risk of false signals is lower, as is the risk of a sudden shift out of trend. When we consider high yield bonds as a portfolio of offsetting credit and interest rate risks, we see that it is attractive candidate for Counterpoint Tactical Income’s quantitative trend following model. Investors in income-producing assets should be mindful of the prospect of rising interest rates. All else equal, a rising rate environment drags on returns. We believe Counterpoint Tactical Income’s allocation to high yield bonds helps to diversify interest rate risk relative to other fixed income assets, lowering volatility relative to expected returns. At the same time, high yield’s unique risk profile lends itself to trend following tactical allocation, which we believe is a key tool for avoiding portfolio drawdowns and reducing downside risk. Sharpe Ratio is defined as a measure that indicates the average return minus the risk-free return divided by the standard deviation of return on an investment. BofA Merrill Lynch Current 5-Year US Treasury Index is an unmanaged index that tracks the performance of the direct sovereign debt of the U.S. Government having a maturity of five years. BofA Merrill Lynch Current 30-Year US Treasury Index is an unmanaged index that tracks the performance of the direct sovereign debt of the U.S. Government having a maturity of thirty years. The BofA Merrill Lynch High Yield Bond Master II® Index is an unmanaged index that tracks the performance of below investment grade U.S. denominated corporate bonds publicly issued in the U.S. domestic market. The S&P 500 Total Return Index is a broad based unmanaged index of 500 stocks, which is widely recognized as representative of the US equity market in general, and includes dividend reinvestment in its value. The referenced indices are shown for general market comparisons and are not meant to represent the Funds. It is not possible to invest directly in an unmanaged index. Mutual Funds involve risk including the possible loss of principal. The use of leverage by the Fund or an Underlying Fund, such as borrowing money to purchase securities or the use of derivatives, will indirectly cause the Fund to incur additional expenses and magnify the Fund’s gains or losses. Derivative instruments involve risks different from, or possibly greater than, the risks associated with investing directly in securities and other traditional investments. There is a risk that issuers and counterparties will not make payments on securities and other investments held by the Fund, resulting in losses to the Fund. The Fund may invest in high yield securities, also known as “junk bonds.” High yield securities provide greater income and opportunity for gain, but entail greater risk of loss of principal. Past performance is no guarantee of future results. There is no assurance the Funds will meet their stated objectives. Investors should carefully consider the investment objectives, risks, charges and expenses of the Counterpoint Tactical Equity Fund and Counterpoint Tactical Income Fund. This and other important information about the Fund is contained in the prospectus, which can be obtained at counterpointmutualfunds.com or by calling 844-273-8637. The prospectus should be read carefully before investing. The Counterpoint Tactical Equity Fund and Counterpoint Tactical Income Fund are distributed by Northern Lights Distributors, LLC member FINRA/SIPC.